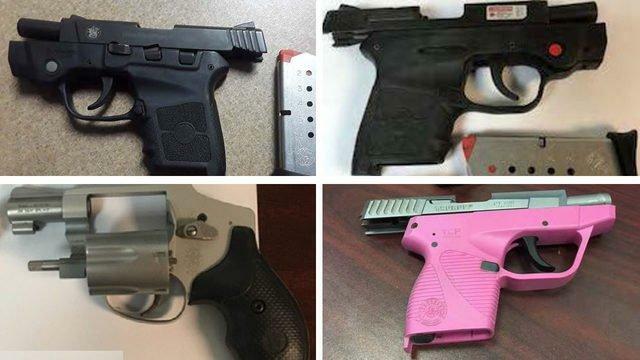 Transportation Security Administration (TSA) agents confiscated a record-breaking number of guns at Atlanta’s airport. TSA’s security screeners confiscated 30 guns last month at Hartsfield-Jackson International Airport. TSA says that’s the highest number of guns confiscated ever at any airport in the country. Someone commented on social media expressing to buy the guns confiscated. Confiscated guns at the airports in the U.S. can be kept as evidence if there are prosecutions or destroyed. It could also be auctioned on such sites as eBay or sold at a state supply store with the profit going to the concerned state, or donated to a local Boy Scout troop. Last year Atlanta also set the record of most guns confiscated, with the count at 211 by November- the most than any other time or at any other air facility in the country. Atlanta also held the record at 198 guns found in 2016. One of the reasons being given by TSA for the back-to-back records being set by Atlanta on gun confiscation at the airport is that people are rushing and tend to forget they have a gun in carryon. Although, such can also happen just about at any other airport. TSA said last year that it could also be due to a combination of factors: more people flying than ever before and the fact that Georgia is a gun-friendly state where more citizens are packing. TSA gave a tip last year to Atlanta travelers to avoid gun confiscation: if they happen to be in line and realize they have left a gun, they can always get out of line before reaching the screening area to be able to take the weapon back to their car or hand it over if there’s a family member seeing them off. Guns cannot be sold on ebay. I was about to say the same as Douglas, firearms can only be sold on certain sites and then still need to be shipped to a licensed federal firearms licensee. We need to do whatever's possible to get the word out to the anti gunners that contrary to popular thought people cannot just order their firearms online to skirt the background checks. Well at least not legally unless its an in state face to face sale with 2 people that possibly met online. But even then the buyer is best served getting a receipt from the seller with his drivers license number and a signature just in case the gun ends up being stolen. And the seller is smart to do a bit of digging on the potential buyer to try to find out if he is allowed to possess firearms. Why would they bring their guns to an airport? Your'e just asking for them to be taken with all the groin-groping gestapo around the place. I'd drive with a gun instead, much less likely to have it taken away. Alive to comment and advise, shot dead and life inside a grave, no authority over the living.